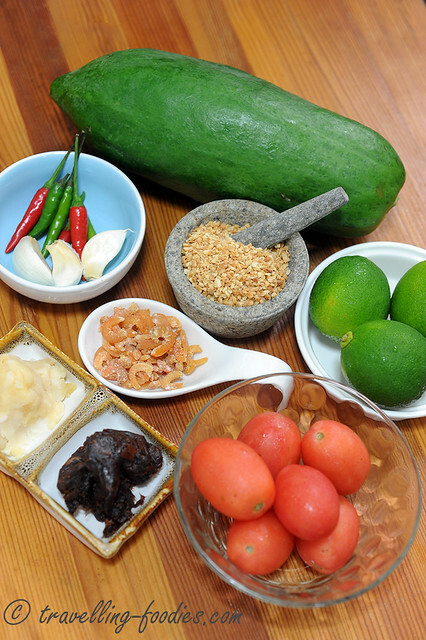 The primary ingredients for Som Tam, except long beans which are missing in the photo as well as the obligatory fish sauce. I love this salad because it is really a bit of everything, sweet, sour, spicy, savory and umami! How much of “a bit of everything” depends really on individual liking. which flavours to accentuate and which others to mellow. This spicy north-eastern vegetable salad is rather versatile and cucumber, green mango, green beans, pineapple or white guava are just some options available. The salad can be flavoured with salted land crabs, fermented fish (plaa raa) or dried prawns. The former two may be deemed as being too exotic for some folks and not easily available in the first place. Dried prawns are good enough to provide support to fish sauce and bring out the umami flavours of the dish. 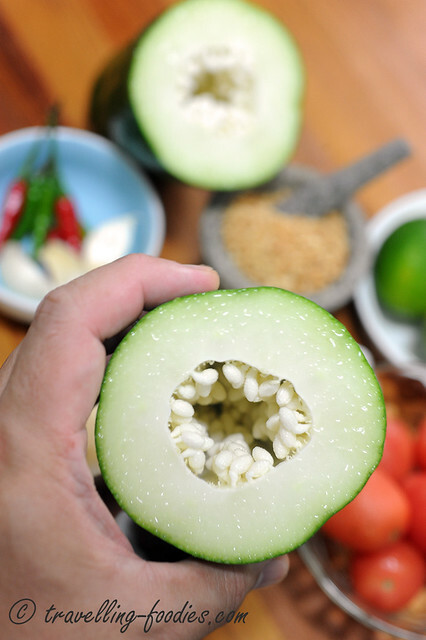 Cross section of the green papaya I’d used. Emerald skin with jade white interior and pearl-like seeds. Not a hint of maturation and ripeness. The fruit is used for the crunch it renders more than anything else, and is otherwise pretty much tasteless. Flavours come from the entourage of condiments used. Unlike the standard versions which serve the long beans “whole”, I sliced them lengthwise likening the papaya so that the texture would be more homogeneous. Same thing for the thai cherry tomatoes used. But for those who prefer more visual contrast, feel free to keep them “intact”. I don’t have the classic tall and conical terracotta mortar with wooden pestle used for making Som Tam so I’d used my batu lesung as a makeshift. But stone is much more “heavy handed” compared to wood of course. So pounding the ingredients in a somewhat half-hearted manner is actually good for making this dish! 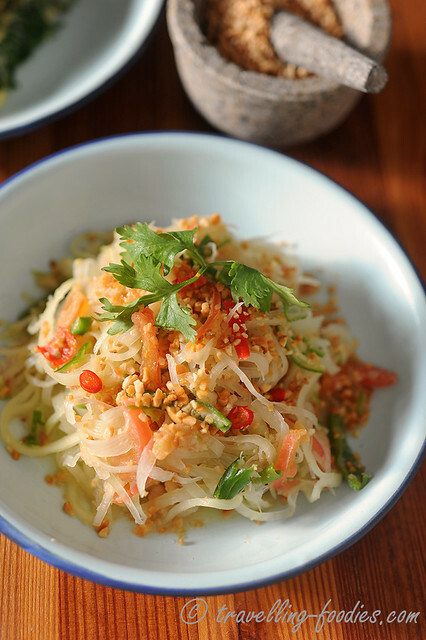 Not too finely though as Som Tam is as much about texture as it is with flavour. Using a pestle and mortar, pound the garlic with the salt then add the peanuts and dried prawns and pound to a coarse paste. Add the lime (if using), bruising it with the pestle, then add the cherry tomatoes and beans to the mortar and carefully work everything together. Next add the bird’s eye chillies, barely crushing them. The more they are pounded, the hotter the dish – and how hot you want it is up to you. Add them earlier if you’re after revenge. 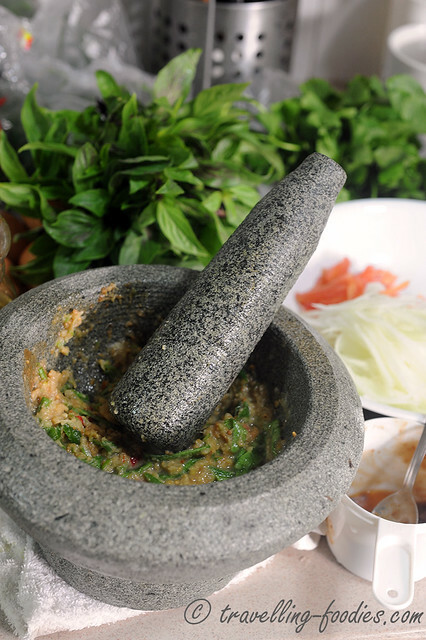 Finally, add the green papaya and lightly bruise with the pestle, while turning and tossing the mixture with a large spoon held in your other hand. Season the salad with palm sugar, fish sauce, lime juice and tamarind water. It should taste sweet, sour, hot and salty. Sprinkle with more crushed roasted peanuts to serve. Place about 1 small bowl of steamed rice on each plate. Spoon over the green papaya salad and eat with fresh raw vegetables, such as cabbage, green beans and betel leaves, and other dishes. This entry was posted on November 11, 2013 by Alan (travellingfoodies). It was filed under Food, Simple Eats and was tagged with ส้มตำ, cherry tomatoes, chilli padi, dried shrimp, long beans, palm sugar, roasted peanuts, Som Tum, spicy, tamarind, Thai, Thai Green Papaya Salad, thai lime, umami. hi alan, thx for your submission! i cant figure out what is that white thing below the garlic and next to the dried shrimps..apa itu? Hi Lena! That is Thai palm sugar… quite soft and pliable! 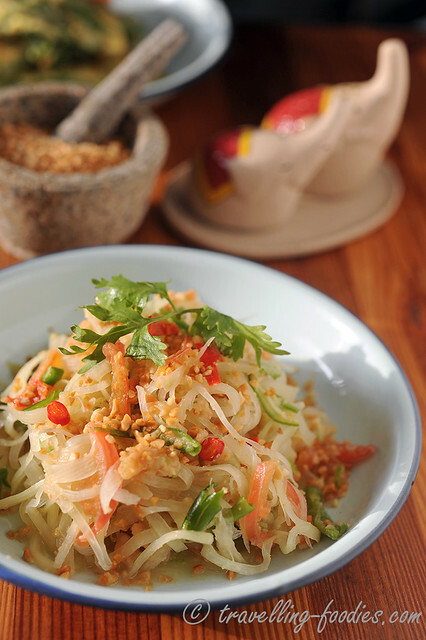 I love eating papaya salad, though have never tried making it at home! This looks so good!